The first round of the World Endurance Championship’s 2018-2019 super season at Spa-Francorchamps wrapped up on Saturday afternoon with news that may not come as a shock: Toyota’s TS050 Hybrids finished a solid 1-2. Which of course means that McLaren F1 driver and WEC rookie Fernando Alonso won the race. WEC’s LMP1 program this season is… not quite what it used to be. With both Audi and Porsche teams gone, Toyota is the sole LMP1 team that isn’t privately owned which means they’re competitively on another level than the rest of the field. Barring disaster, it made sense that Alonso would finish on podium. And thus followed the barrage of Fernando Alonso hype that was just as inescapable during 2017's Indy 500. It makes sense that the cameras would be trained on him. After all, Fernando is the only F1 driver in years to contest an F1 and endurance season simultaneously, just like he was the only F1 driver since Nigel Mansell to contest the 500. But all that attention is something of a double-edged sword. 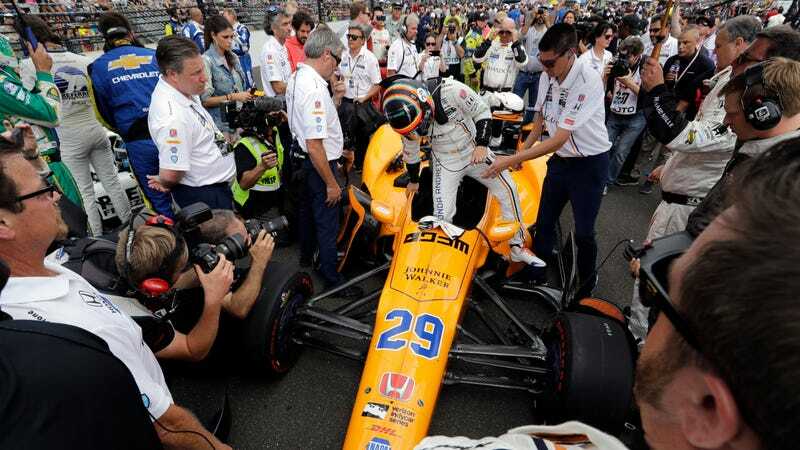 As an IndyCar fan, it drove me nuts that everyone at the 500 only really cared about Alonso. I got real tired of hearing about him real quick—and that’s coming from me, a huge fan of Alonso in F1. IMSA fans got tired of hearing about him during the Rolex 24. And now WEC fans have had a similar experience this weekend: constant updates on Alonso’s position, articles lauding Alonso’s success, and a disproportionate amount of attention focused on one driver. By the time the podium rolled around, it kinda felt like Fernando had driven the car the whole six hours and that the other two guys on the top step with him were just his assistants. I can’t fault the guy. It’s not Alonso’s fault that the media drums up a huge ruckus every time his name gets linked with another series. And it’s pretty damn cool to see an F1 driver pop out of their little bubble to explore other options in the world of racing. You get this feeling that Alonso is a racer, a competitor, not just a F1 driver. He’s not afraid to get behind the wheel of a totally unfamiliar car and potentially fail in that series so embarrassingly hard that no one will ever let him forget it. He’s not just focused on F1. He’s thrown all the excuses out the door, proving that if you want something enough, The Powers That Be in F1 might just let you pursue it. That’s rare. But y’know. It’s also kind of annoying. I won’t take anything away from Alonso. His time behind the wheel of the Toyota at Spa-Francorchamps was masterful and proved exactly why he’s the kind of driver we can’t stop hearing about. He’s damn good at what he does. But let’s hear it for the other boys. Here’s looking at you, Sebastien Buemi and Kazuki Nakajima. Former Formula E Champion Buemi was faultless during his turn behind the wheel. Despite having to make an extra pit stop to re-fasten his seatbelts and despite spinning at La Source, Nakajima had such a commanding lead that no upsets could affect him. The contributions of these two incredible drivers of the #8 Toyota should not go unnoticed. And hopefully, the Alonso hype will simmer down as the season progresses.